Well this is the end of my Fall Offerings for the year, as sad as it! Although I may have a few Thanksgiving pieces yet! It is time to turn my designing thoughts to Christmas! 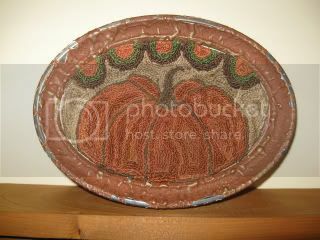 This is a very simple lone pumpkin that I needle punched and put in this small old oval frame. It is metal and someone painted it a burnt rusty lumpy orange color which compliments the pumpkin nicely. I did my punching on weavers cloth with Valdani floss and then coffee dyed it. The original small clasp ring is on the back for hanging. 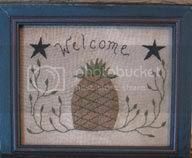 The frame measures 7 1/2"w x 51/2"L.
Have the Happy Fall and Harvest blessings! This is a neat old box I found at an antiques store that I believe was used to hold mail or envelopes. I left it untouched and designed and punched three little pumpkins and some leaves for it. 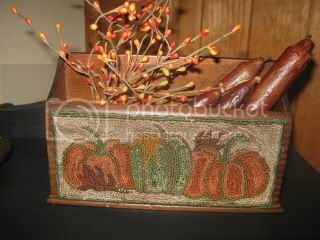 A fun box to fill up with some Autumn goodies, like berries, drieds, leaves or candles. I did my punching on weavers cloth with Valdani and dmc floss and then dyed it with coffee. It measures 7 1/2" long x 5" tall and 2" deep. Candles and berries are not included. Here is a little needle punch pocket that I designed and punched. I have a simple white pumpkin on a black background. I frayed the edges on the four sides giving it a primitive look and then I hand sewed the black back wool pocket. I did my punching on weavers cloth using dmc floss and dyed it with coffee to age it up a bit. 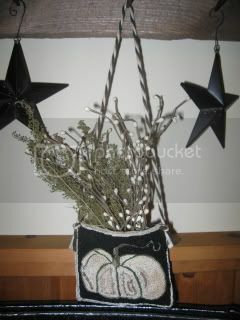 I used an old black and white tie for hanging that came off of an old antique hat box. The tie is attached with rusty safety pins in case you would want to display it flat. I have a small sprig of Sweet Annie and some white berries tucked in. 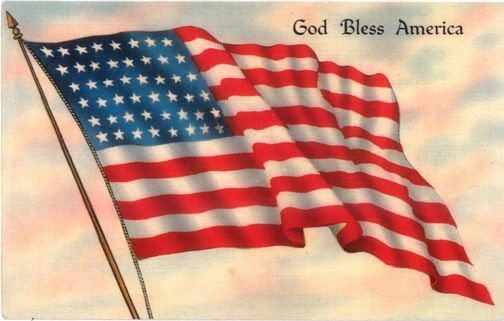 This small pocket measures 4 1/4"x4 1/2". It will cute hanging from a hook or off a knob. Happy Fall!